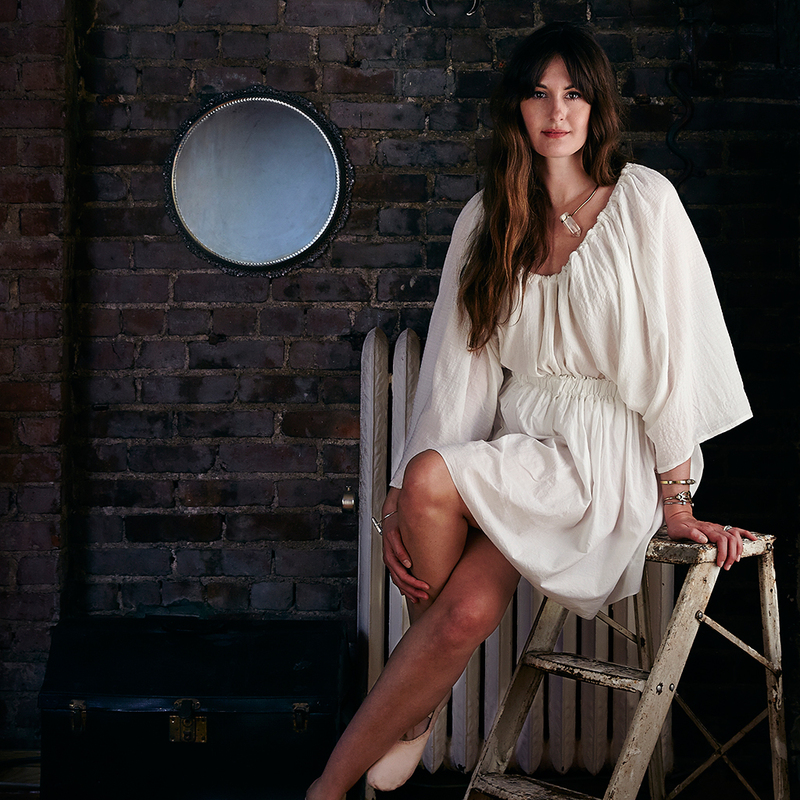 Before launching her jewelry brand, Laurel Patrick, Brooklynite Alexis MacDonald spent a decade designing shoes and traveling to factories overseas. “I always felt that I wanted to be hammering the leather and stitching. I really like the production process,” she says. So she changed paths and dove into her own brand, studying under New York jeweler Michael Fitzgerald and experimenting with metal-smithing and wax-carving. It paid off: Laurel Patrick’s crystal-centric pieces sell in chic spots like the Wythe Hotel in Williamsburg and the West Village’s Albertine. On the heels of her new website launch, we talked to this creative lady about smoothies, swear-by-it French skincare and the joy of the early-bird dinner. I have a large collection of (1) jewelry that I inherited from my grandmothers. I really love the craftsmanship of that jewelry; you can’t find it in the current market. It’s a different quality, a different process. I want to go back to that. I also go to shows to find gems that I like and take them home, and I kinda stare at them a lot. I put them in different configurations on the floor, and I play with them, and they kind of speak to me in some way. That’s the cool thing about starting your own thing. There are no rules. You can create your own process. You’re tuned in to the powers assigned to certain stones. Do you gravitate toward a certain quality? I really love (2) tiger’s eye. It’s meant to help heal broken bones and relieve congestion and digestive problems. And I’m always searching for the (3) clearest quartz. There’s something really magical about that to me. It’s the master healer; it amplifies energy and thought and emphasizes any other stone that’s around. It’s like the superpower of them all. What are your food habits when you’re working? My studio is in my apartment in Brooklyn Heights, and I go to a sushi restaurant called (4) Hibino two to three times a week for lunch. (I like plum rolls.) It’s a really amazing, authentic, peaceful atmosphere where I can sit and relax. I also drink a lot of (5) banana-pecan smoothies throughout the day to keep me going—and (6) espresso. I work in my studio for like four hours in the morning, then I run into the jewelry district for three hours, then I go to another studio in Fort Greene at night to solder, so there’s a lot of running around. What’s a look you like for going out? I’m pretty casual nowadays, and I wear a lot of my friends’ clothing, local designers. I’m really obsessed with my (7) Ulla Johnson cape, and I might wear my girlfriend (8) Diana Broussard’s shoes. I have five of my own bracelets on all the time. I just accessorize what I’m wearing every day to go out. Refined bohemian, I guess, if you had to call it something. I also really love (9) Caron Callahan’s aesthetic, and her clothes are all produced in New York. I find (10) Lauren Manoogian’s stuff really interesting, because she started out as a jeweler and transitioned into knit ware, and her knit ware is phenomenal. Just effortlessly chic. For a special occasion, I love (11) Battersby. I love the fresh pasta, that crunchy kale salad, the wine selection. It’s just the perfect meal. But for going out at the end of the day, I’d go somewhere like (12) Chez Moi. I love to get the steak frites; their mussels and fries are also phenomenal. It’s authentic and no frills, a place you can go relax in an un-sceney atmosphere. My husband and I actually (13) go out to dinner between like 5 and 6 p.m., because we don’t like to be caught up in the rush-hour scene. I find it stressful. I just don’t want to be in a restaurant where I can’t hear the conversation or everybody’s just looking around. It’s too much. If we’re going for cocktails, we like (14) The Long Island Bar in a restored mid-century diner. It’s very art deco; it really transports you. They make an amazing bourbon Bloody Mary and a good gimlet. And I love that they have Hitachino on tap—it’s like the only beer I can drink since I had to go gluten-free! (15) Coconut water! I drink an entire liter before bed, then follow it up with a normal-sized serving in the morning. What kind of skincare do you love? I’m really, really, really into (16) Avène, a French line for sensitive skin. It’s super gentle and made with good ingredients. The redness-reducing cream is my daily moisturizer. I use the whole line. (17) Calico wallpaper. I actually had the pleasure of getting to shoot my first campaign for my website in their studio, and that was a dream come true, because I love their product and stand by their whole process. And I love Antwerp. The vibe there is magical, and they appreciate artisan culture and design. The (18) De Witte Lelie is the best hotel for designers: You get these little A-frame cottage rooms, and you can just design away. They have little ladders that go up to landings, where you can sit on a rug and have a brandy. It changed hands—it used to be even more raw and dreamy. It holds a special place in my heart. Ohhhh, yeah! (19) French fries. I love french fries, mashed potatoes, anything potatoes. Truffle fries. And I love stretch pants! Who doesn’t? You’re kidding yourself if you’re going to tell me you don’t like stretch pants.